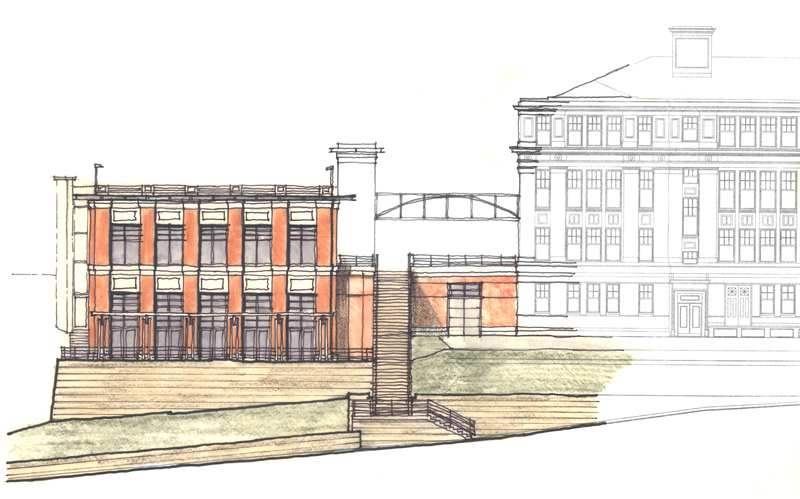 The project included full exterior and interior renovation of a vacant, deteriorated masonry building on the National Register, and a new lab and classroom building connected by a pedestrian bridge. Classrooms and seminar rooms for the top two floors of Oglebay Hall are now the home of WVU’s Forensic and Investigative Science Program and contain technology intensive teaching labs including Mitochondrial DNA labs. The lower two floors contain a mix of general purpose classrooms, labs, offices, and support spaces. Intensive mechanical systems were integrated into the building utilizing the existing attic and ventilation chimneys, avoiding any impact on the building’s historic exterior. New Ming Hsieh Hall contains a double height gathering space, two large lecture halls, and rooftop parking. The building has its own form and identity while playing a supporting role in the ensemble of new and old.